Frankie Trumbauer was one of the most important jazz saxophonists in the early decades of recorded jazz, and was especially influential as a bandleader and catalyst in many important recordings during the 1920s and ‘30s. As well as playing alto and tenor sax and clarinet, he was probably the leading exponent of the C-melody saxophone, which gave him an important role in bands such as Paul Whiteman’s, with whom he played for many years as well as leading his own orchestra. He is especially well known for his recordings with Box Beiderbecke, with whom he collaborated on some of the most influential and significant recordings in early jazz. 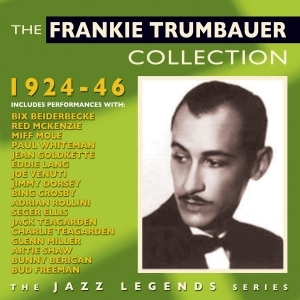 This great-value 47-track 2-CD set has been deliberately compiled so that it does not cross over with the two Bix Beiderbecke collections which we have on catalogue, which already feature many noted recordings on which Frankie Trumbauer is featured. These are “Bix Beiderbecke 1927-30” (Fabulous FAB144) and “The Bix Beiderbecke Collection 1924-30” (Fabulous FAD2038). With this new collection we have trawled across Trumbauer’s entire recording career spanning just over two decades, selecting different material (apart from duplicating one track) from his work with Beiderbecke from that included on the collections mentioned, as well as his early work with various line-ups, and his extensive recordings with jean Goldkette and Paul Whiteman, alongside those with his own orchestra. It is a fascinating overview of the career of an artist who has perhaps not received the recognition he deserves. 5 Tessie, Stop Teasing Me Ray Miller & His Orch. 6 Hush-a-bye Jean Goldkette & His Orch. 7 Hoosier Sweetheart Jean Goldkette & His Orch. 8 Blue River Frankie Trumbauer & His Orch. 9 Clementine Jean Goldkette & His Orch. 11 Baltimore Frankie Trumbauer & His Orch. 13 Changes Paul Whiteman & His Orch. 15 Mississippi Mud Frankie Trumbauer & His Orch. 16 From Monday On Paul Whiteman & His Orch. 17 Our Bungalow Of Dreams Frankie Trumbauer & His Orch. 18 Borneo Frankie Trumbauer & His Orch. 19 I'd Rather Cry Over You Paul Whiteman & His Orch. 20 Bless You, Sister Frankie Trumbauer & His Orch. 21 High On A Hill-Top Frankie Trumbauer & His Orch. 22 Futuristic Rhythm Frankie Trumbauer & His Orch. 23 I Like That Frankie Trumbauer & His Orch. 1 Shivery Stomp Frankie Trumbauer & His Orch. 2 When You're Counting The Stars Alone Paul Whiteman & His Orch. 3 Manhattan Rag Frankie Trumbauer & His Orch. 5 Happy Feet Frankie Trumbauer & His Orch. 6 Deep Harlem Frankie Trumbauer & His Orch. 7 Hittin' The Bottle Frankie Trumbauer & His Orch. 8 Bye Bye Blues Frankie Trumbauer & His Orch. 9 Georgia On My Mind Frankie Trumbauer & His Orch. 10 Crazy Quilt Frankie Trumbauer & His Orch. 11 Sizzlin' One-Step Medley Frankie Trumbauer & His Orch. 13 Business In Q Frankie Trumbauer & His Orch. 14 Break it Down Frankie Trumbauer & His Orch. 15 Long About Midnight Frankie Trumbauer & His Orch. 16 Troubled Frankie Trumbauer & His Orch. 18 Ain't Misbehavin' Frankie Trumbauer & His Orch. 19 Diga Diga Doo Frankie Trumbauer & His Orch. 20 Taboo Frankie Trumbauer & His Orch. 21 No Retard (China Boy) Frankie Trumbauer & His Orch. 22 Walkin' The Dog Frankie Trumbauer & His Orch. 23 You Took Advantage Of Me Frankie Trumbauer & His Orch.